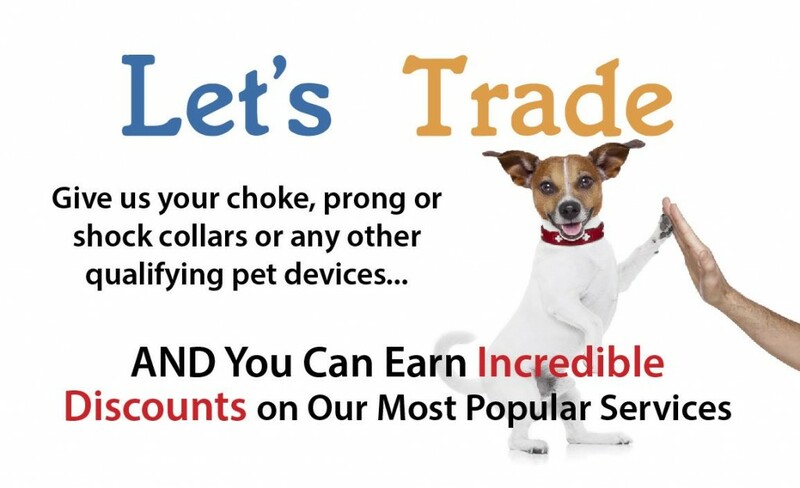 We want to encourage you to swap great discounts on pet training and care services for your choke, prong or shock collars or any other qualifying pet gear. By participating in “Project Trade” you can earn up to 10% off participating member services simply by giving them old pet gear* you have laying around. It couldn’t be easier! Project Trade is the Pet Professional Guild’s (PPG) international advocacy program that promotes the use of force-free pet equipment by asking pet guardians to swap choke, prong and shock collars (and any other devices that are designed to change behavior or care for pets through pain or fear). Because we want all pets and their guardians to experience the huge advantages and long-lasting effectiveness of force-free training and pet care, we will give you great discounts on our most popular, effective, fun and pain-free training and pet care services in exchange for your old gear.